For a change, we know exactly where this one comes from: The Arabian Nights, more properly entitled The Book of the Thousand Nights and a Night, a collection of stories in Arabic derived from Indian, Persian and Arabic sources. In The Barber’s Tale of his Sixth Brother the storyteller speaks of his brother Shakashik, who had once been rich but became poor. 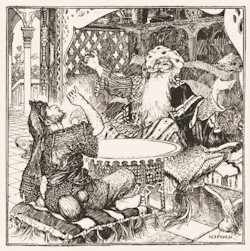 He asked for alms at a grand house and was welcomed by its owner, Barmecide, who proceeded to put a series of imaginary dishes before him, pretending they contained the most sumptuous feast: “Presently he cried out again, ‘Ho boy, serve up the marinated stew with the fatted sand grouse in it’; and he said to my brother, ‘Up and eat, O my guest, for truly thou art hungry and needest food.’ So my brother began wagging his jaws and made as if champing and chewing, whilst the host continued calling for one dish after another and yet produced nothing save orders to eat”. The beggar played along, but after his host had pretended to serve him some excellent wine, he pretended to get drunk and gave him a hard blow. Barmecide took this in excellent part, praising him for entering into the jape. He gave him a real feast and, as the story says: “Next morning the two fell again to feasting and carousing, and ceased not to lead this life for a term of twenty years”. The stories first appeared in an English translation at the start of the eighteenth century, immediately took the public’s fancy, and Barmecide appeared in the language almost instantly. A Barmecide feast or Barmecide meal is one that looks good but doesn’t live up to expectations. The adjective is barmecidal.